We had been in two minds whether to take a side trip out to McCarthy. The weather has been so bad that we were thinking that it was time to leave Alaska and find some sub. However talking to a few people persuaded us that we would be foolish to miss out (and suggested that the weather was generally a bit better !). McCarthy is reached via the McCarthy road which is a 60 miles long gravel road. This wasn’t so bad until the last 25 miles which I think probably rates as the worst road we have driven in Alaska. The 60 miles took us just over 3 hours. 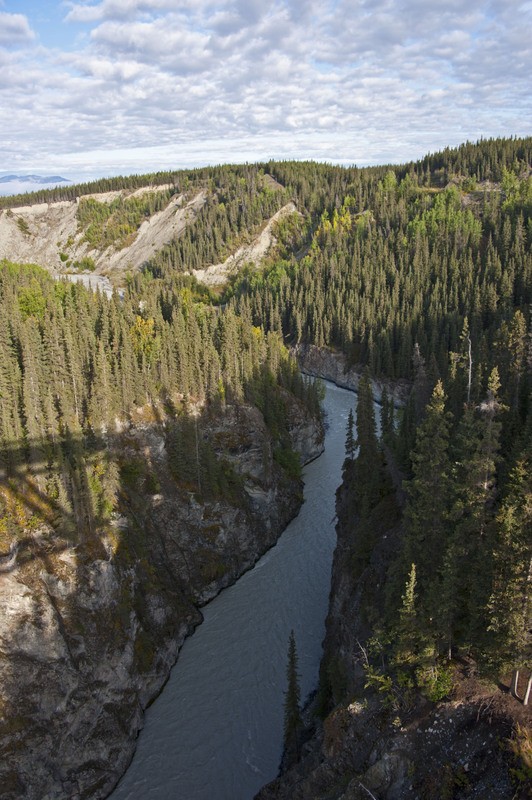 The best bit of the road is the crossing of the Kuskulana river which is a one lane bridge over a deep gorge, built as part of the railway in 1910. It is over 600 feet long and is 400 feet over the water below – before 1988 it didn’t even have guard rails ! At the end of the road are a number of parking lots which you have to pay to park in. They are all within the last half a mile of the end but the nearer you are the more you pay. 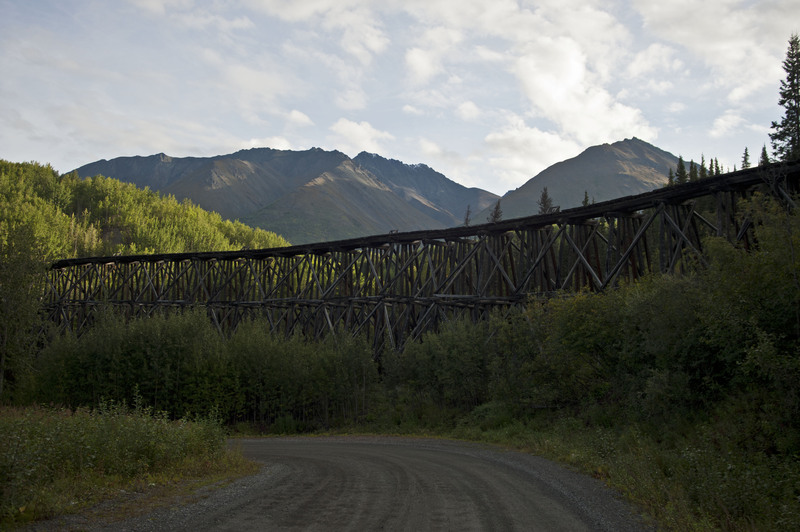 At the end of the road you haven’t reached McCarthy but instead a footbridge which crosses the Kennicott River leads to the town itself. On arriving we chose the cheapest car park and got on our bikes to ride into McCarthy itself. 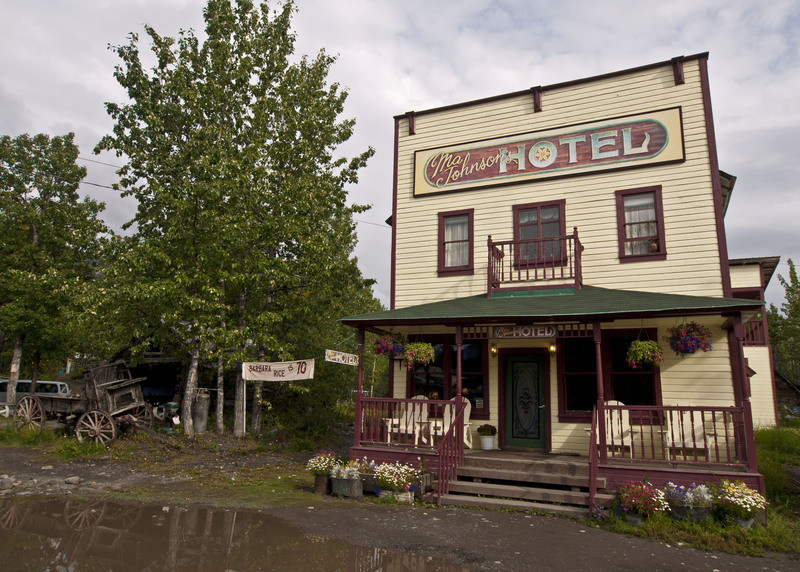 The town (well hamlet) is pretty small with a couple of hotels, a shop and a bar. After driving the road in we needed a beer so we popped into the bar and a had a bit of food while we were there. 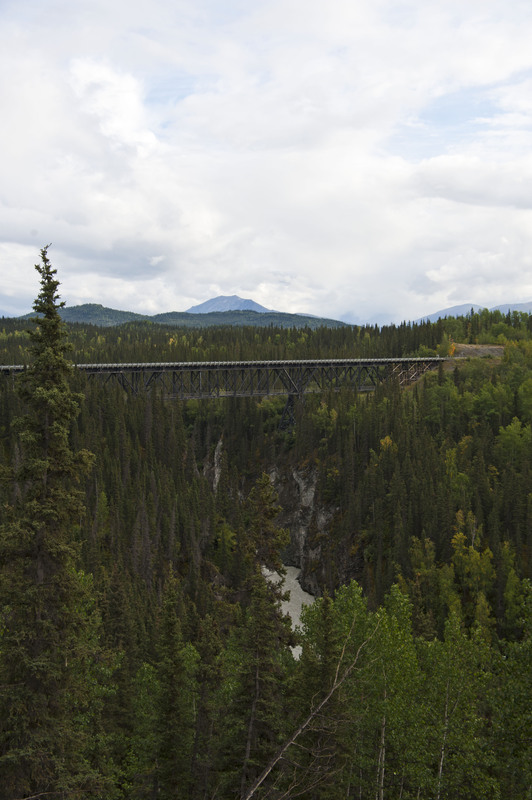 The next morning we got up early and walked over the footbridge to get the shuttle bus to Kennicott. This is a journey of about 5 miles. 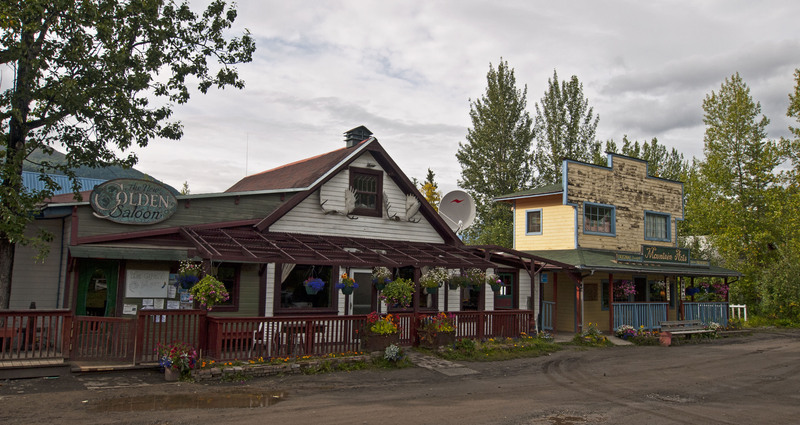 Kennicott was a thriving town back in the 1930’s when it was the centre for Copper Mining in the Area. 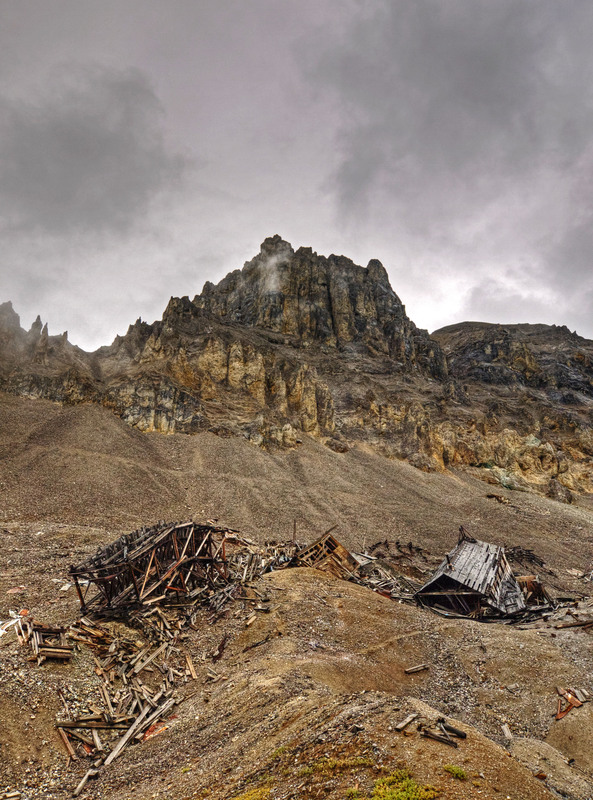 There were a number of mines in the surrounding mountains. 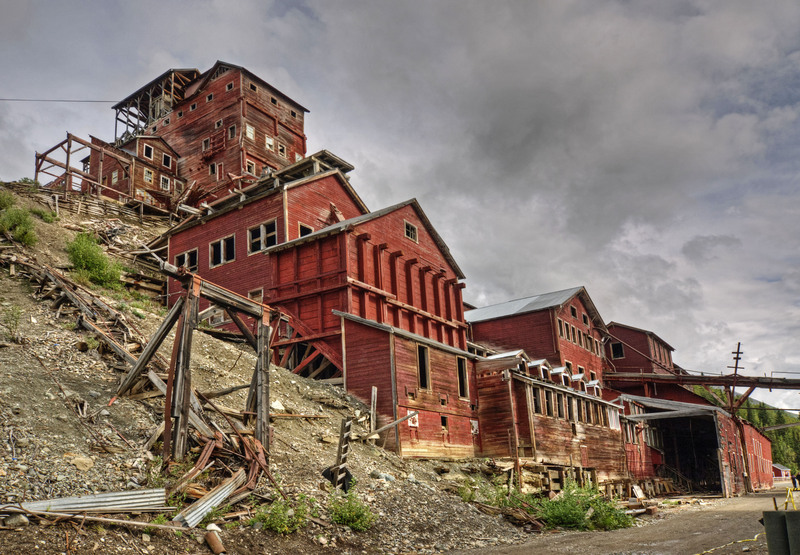 The ore was brought down to the Kennicott Mill by a network of Aerial Trams. 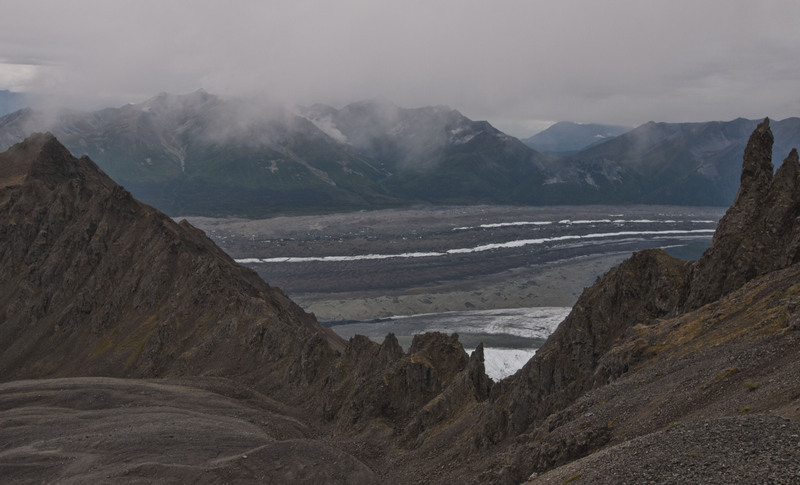 From Kennicott the processed ore was carried out in the CR & NW (colloquially known as Can’t Run & Never Will) which ran from Kennicott to Cordova. 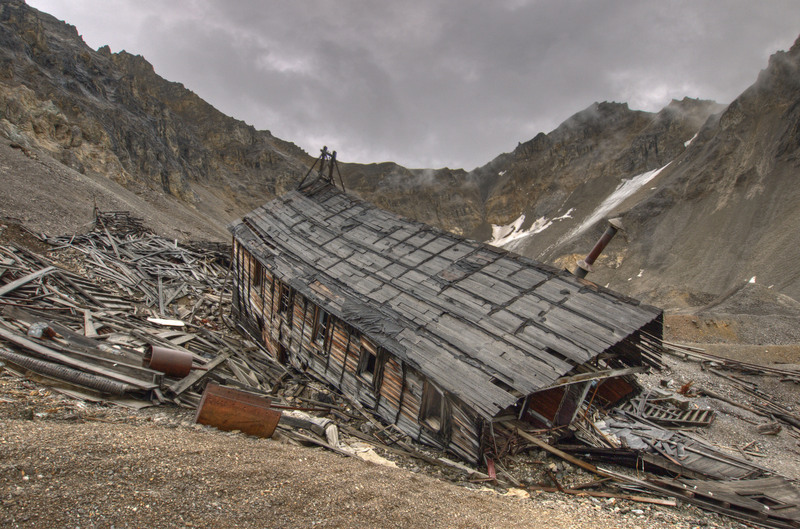 The mine shut down in the late 1930’s and the route across country soon closed. 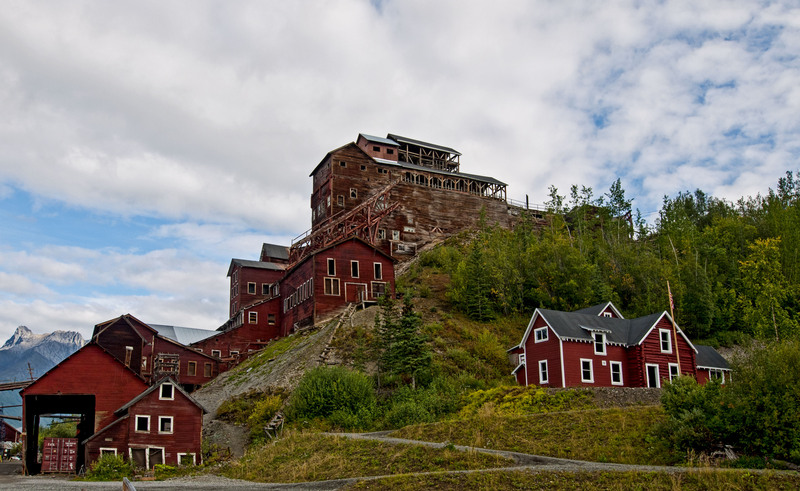 We decided to do one of the hikes from Kennicott up to one of the mines, Jumbo Mine. This was a pretty tough hike which was over 3300ft up over 5 miles. 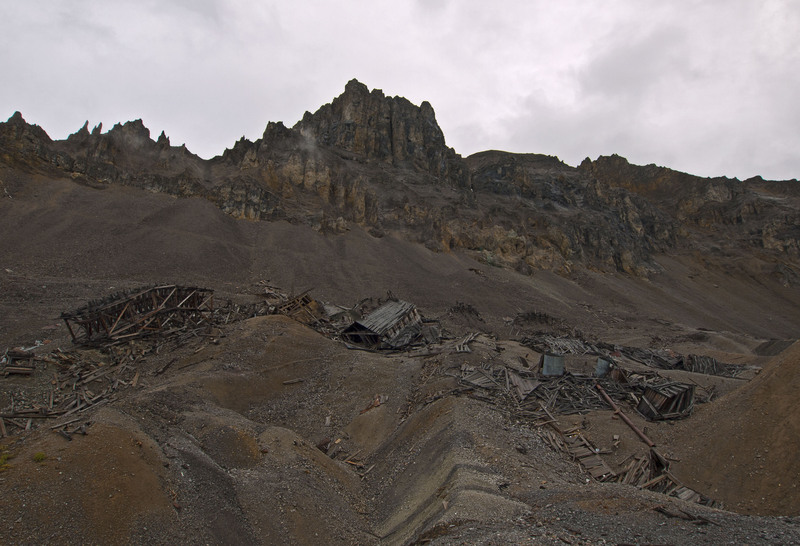 The last mile or so involved climbing up a really steep scree slope into the Cirque where the mine was situated. Some of the buildings were still partially standing but most had collapsed. When we got down we were absolutely knackered. We decided that we would only spend the one day in McCarthy and when we got back to the Beast we started back out down the road. We conquered that nightmare 25 miles and spent the night at the remains of a trestle from the CR & NW Railway.